Spring Special; $49.95 first application (up to 1/2 acre lot), no contract required just to try the service. Tired of just looking at your beautiful backyard and not being able to enjoy it? Citronella candles and bug zappers not cutting it? We can help with pest control in Wichita! Our system significantly reduces mosquito populations 95% for up to 28 days. We can return your backyard to your family. *Current promotion; $50 credit towards your bill when you refer a friend and they sign up for season long service. 1. We will survey your property for mosquito harboring areas. 2. We will then concentrate our program on those areas every 28 days; in addition, we will also spray the perimeter of your property adding even more protection. 3. In two to three days the mosquitoes will start to die. You can expect to see over 90% reduction in mosquito populations thus returning to you, your outdoor space. We spray a fast-drying rain-fast product that has one of the lowest EPA ratings, 'caution'. This product is derived from chrysanthemum flowers and is commonly used in hospitals, schools and inside homes to treat a wide range of pests. Pets & children can enter the treated area after the product is dry, this usually takes no more time than 30 minutes. We spray all the non-flowering and non-edible plants around the perimeter of your home and around high traffic areas. After our product dries it creates a 28 day barrier on all of the sprayed areas more importantly when the mosquitoes return to the treated areas they are killed. During the day mosquitoes like to rest in the shade of vegetation because of this we target those hiding areas. For this reason, some properties with wide open spaces and little vegetation our program may not be as effective, the more vegetation, the better. Creating the perimeter barrier is key. If your home only has a few plants along the foundation, then unfortunately mosquito control probably won't be very effective either. But if there is ample plantings we can give you up to a 90% reduction of these unwanted guests. There are two ways mosquitoes overwinter; hibernate or lay eggs. When temperatures reach a consistent 50 degrees hibernating mosquitoes wake up and eggs begin to hatch. In Kansas that is roughly early April. Early applications help keep mosquito populations down and later applications help kill hibernating and egg laying mosquitoes that will emerge the following spring. *If lot is larger than 1/2 acre we can treat backyard only to keep the price $74.95. Season long will be $62.46 per application, $374.75 per season. By pre-paying, you pay for 5 applications and get a 6th one free. 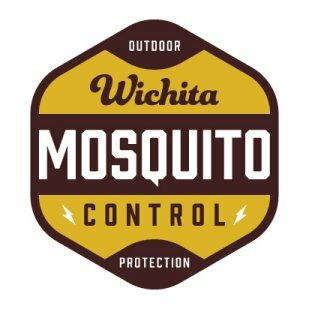 $74.95 “Pay as you go” structure, You will be scheduled for the entire season and billed individually for each treatment until you cancel or choose the months you want mosquito control in advance when you sign up for service. It is, however, never too late to start spraying for these pests, we can start applications at any time of the year so don't be discouraged if we start later than April. Call for a free estimate 316-685-1794.